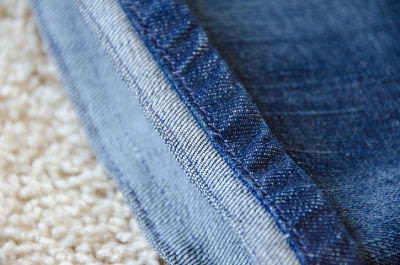 I'm only five feet tall so nearly every pair of jeans I buy (unless its in the girls section) has to be hemmed. I've faced the fact that even petite sizes run too long for me (yes, even in heels). It'd be great if I could always find jeans in the girls section, but sometimes finding a pair that isn't bedazzled, glittered or embroidered with hearts and flowers is rather difficult, especially in my size. That's pretty basic and typical. 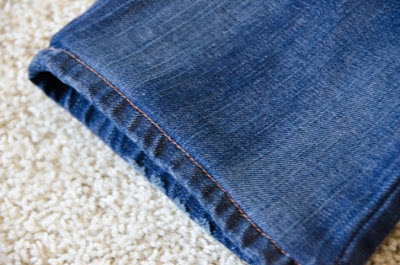 It looks great for the unwashed jean, but what if the jean is tattered (purposefully), washed and imperfect to begin with? 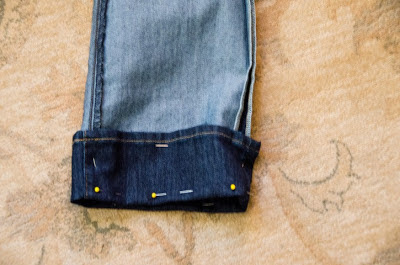 For those pairs of jeans, I want to keep that hem so I will shorten the jean, but not cut off the hem. It's not that difficult. 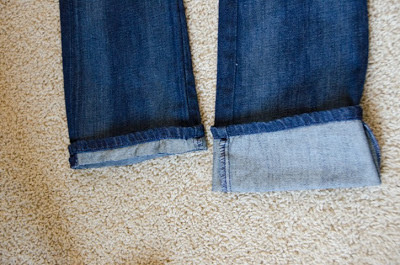 Fold up the jeans and pin. 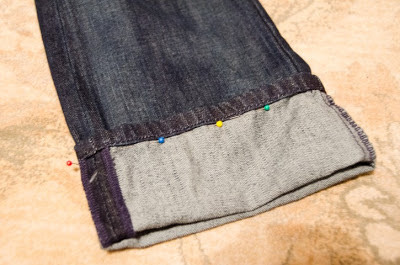 After you have pinned it, unfold and try them on to make sure they are the correct length. Next sew just below the original stitch. 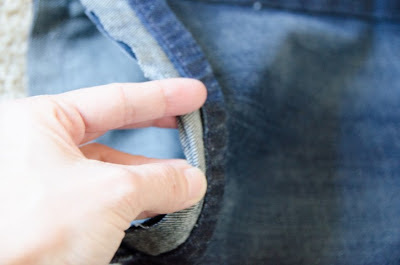 DO not sew over or beyond that stitch because you want to have that stitch seen. 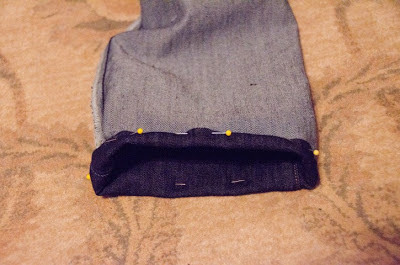 For example, in the picture below, you would sew where the white needle heads are. 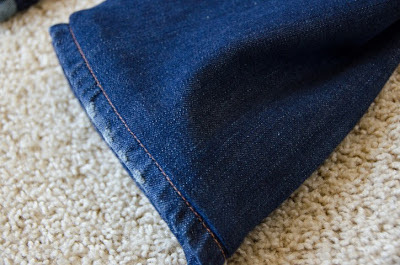 Once you are done, flip the hem down and press. Voila! 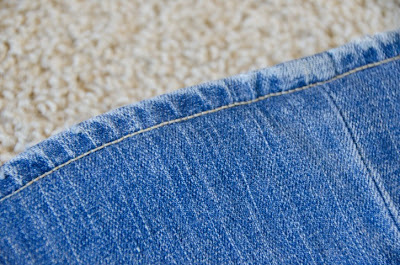 Perfect original hem, tattered, washed and all. 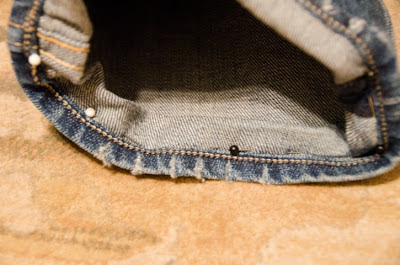 That was a pair of my petite pants so I only had to shorten it an inch (that wearing. No cutting was required. What if it were longer? Here's a pair where I need about 6 inches off. 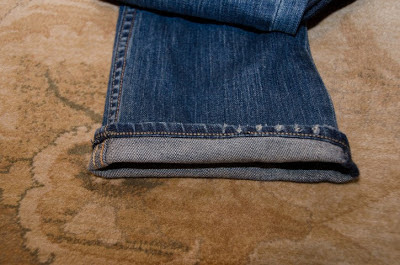 What was I thinking when I bought these jeans? 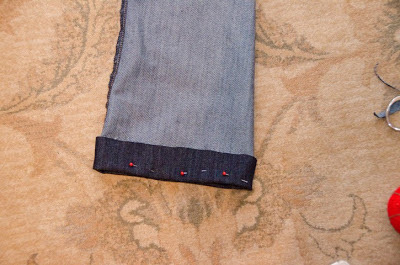 After sewing along the hem line stitch, cut off all but an inch below that hem line. I should have straighten the jeans so that it doesn't look crooked (its not crooked, trust me :)). Next, you can do one of two things. 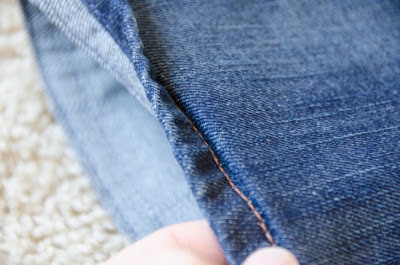 You can hem the frayed edge using a zig zag stitch or you can take it a step further by folding in the two edges toward each other. 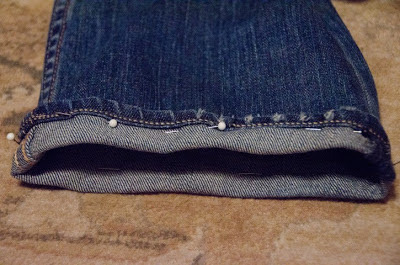 Here I fold each side towards the center and then close them together. 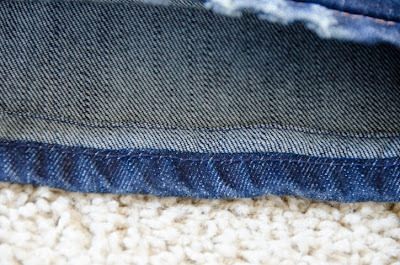 Sew close to the folded edge for a clean look. Although, this will not be seen. 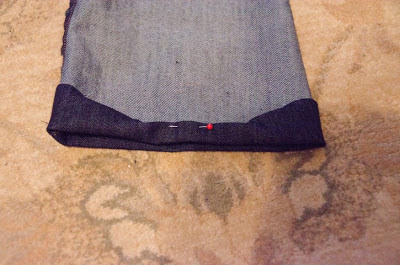 Pull the hem down and press. 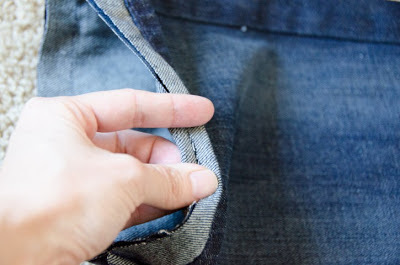 but on the outside, once again you have your original hem.